Congratulations on your well deserved challenge win! It is a magnificent capture. Have you entered it in The color brown photo contest? What an amazing shot! Congrats! How does one get this shot. So amazing. This picture makes my heart smile! Such a beautifully stunning shot. Magnificent picture! For some reason the buttons aren't working... ? I give this a "LOVE" rather than just a Like! Doesn't get any better than that. Well done! Absolutely amazing photograph!!! Well done!!! I LOVE this SO much! Super Capture! Awesome capture...did the little bear make it up ? Where was this shot taken? This is my favorite ever photo! Beautiful image!!! Congrats on your finalist award! 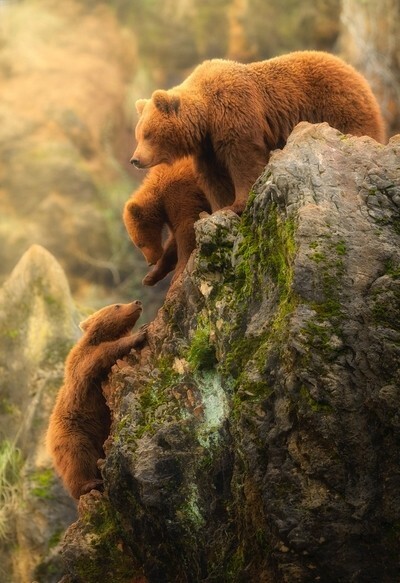 A family of brown bears climbs a steep hill. One of them is left behind and the others await his arrival. The photograph is made in the nature park of Cabárceno, Cantabria, northern Spain. A very special place, where dozens of brown bears coexist together in an environment full of caves and rugged terrain. It was taken during the golden hour, while the sun colored the natural environment, and created a very special atmosphere. The sun outlined its beautiful silhouettes, creating textures in its fur. The light was completely natural, without external help. It was the golden moment of sunset. The photo is made with a Nikon D7100 and a sigma 150-600 telephoto. Right now I use the same lens, but with a Nikon D850. I usually look for a message in my animal photographs that I transmit. I want to create a feeling, a reaction beyond a simple documentary photograph. A photograph has to have a hidden emotion so that it has a certain value. This is my subjective opinion of the animal photography.In this picture I wanted to show the human side of these bears. It seems that one of them tries to help with his hand the last of his group to climb a steep mountain top. For this photograph I have used a basic development in ACR, with a simple adjustment of levels and colors. Currently, my two favorite disciplines in photography are Landscape and Animals. For this, I use a Nikon D850, a Sigma 150-600 and a Nikon 14-24. For landscape, I sometimes use the Lucroit filter system with neutral density filters. You have to be aware that photography is not a simple discipline. There are many days that you arrive home without any photographs that you like. You have to have a lot of patience and perseverance, especially in the case of animal photography. the one that everything goes well and the work and the time invested have their reward. The most important thing is that you like what you do, and the good photographs will arrive little by little.